Clay maquette of 'The Red Palm Nut', Marla Friedman. Dr. Jane Goodall’s study of the lives of wild chimpanzees proved that there is no sharp division between humans and the other species with whom we share this Earth. As a 26 year-old, Dr. Goodall went into the forests of Tanzania with a notebook, used binoculars and a passion for learning about animals. After months of hard work and frustration, came a moment of clarity when Jane connected with David Greybeard, the chimpanzee who would become one of her most important teachers. David Greybeard was the first wild chimpanzee to allow Jane Goodall to come close as she offered him a red palm nut, and in this moment with David’s acceptance, the world of the chimpanzees of Gombe opened up to her. This moment of #conscienceconnection changed everything, and now lives in the form of a bronze sculpture, ‘The Red Palm Nut’ by Marla Friedman, to be revealed tomorrow for Dr. Goodall herself on Jane’s 84th birthday! Friedman, renowned for her sensitive portraits of such luminaries as Archbishop Desmond Tutu, Apollo 13 astronaut James A. Lovell, Jr., Supreme Court Justice Sandra Day O’Connor, and Abraham Lincoln, was formally trained in the Realist Tradition of painting and drawing. 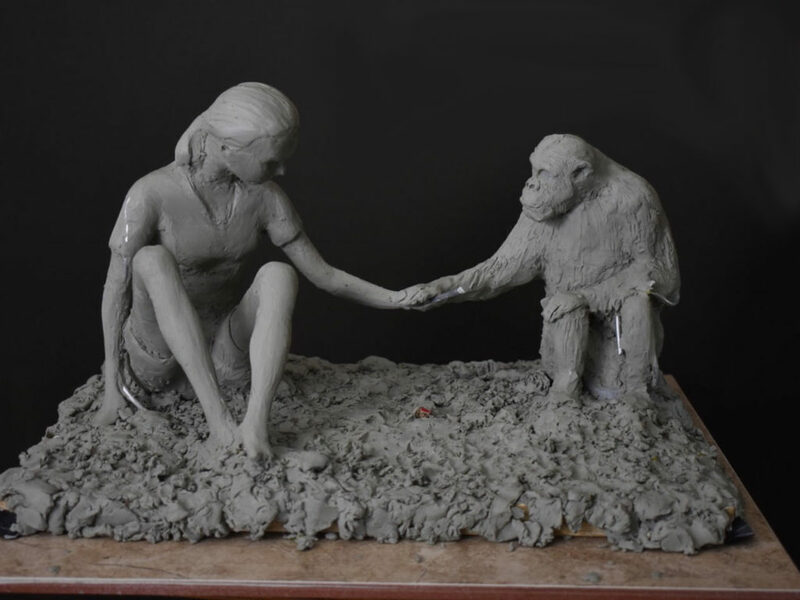 Self taught in the medium of sculpture, Friedman has collaborated with Dr. Goodall on this piece, titled ‘The Red Palm Nut’, along with her portrait sculpture beginning in 2016. ‘The Red Palm Nut’ is to be unveiled at the Chicago Field Museum tomorrow, April 3, on Dr. Goodall’s 84th birthday to commemorate Jane’s contributions, and to invigorate this generation and future generations to learn from this wisdom. Clay maquette of ‘The Red Palm Nut’, Marla Friedman. Final bronze sculpture is monument size located at the Chicago Field Museum. Share your #ConscienceConnection on social! From one moment of connection, a lifetime of conscientious action. 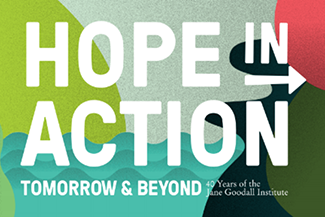 Today, Dr. Goodall and the Jane Goodall Institute are taking this redefinition further by working tirelessly to learn more about, and save our great ape cousins and other wildlife from extinction, while also being advocates for the well-being of all animals. 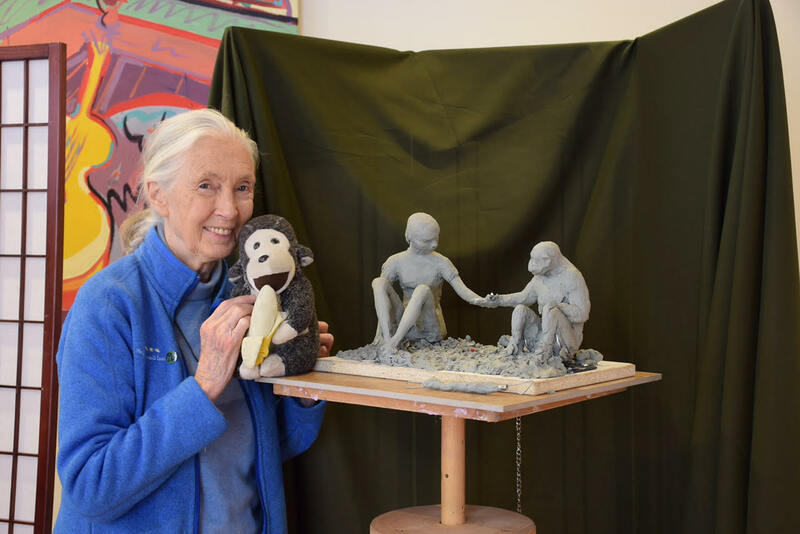 To celebrate Dr. Jane Goodall’s birthday and the unveiling of Marla Friedman’s sculpture depicting one of the most iconic moments in our shared history, join us in sharing the moment you recognized your #conscienceconnection to other life on Earth by sharing a photo or message using the hashtag and tagging @janegoodallinst. Example post: Share an image of you and your dog on social tagging #conscienceconnection @janegoodallinst! As a part of that post, tell us about a moment with that animal that made you realize your role as one part of a larger, interconnected world of living beings.